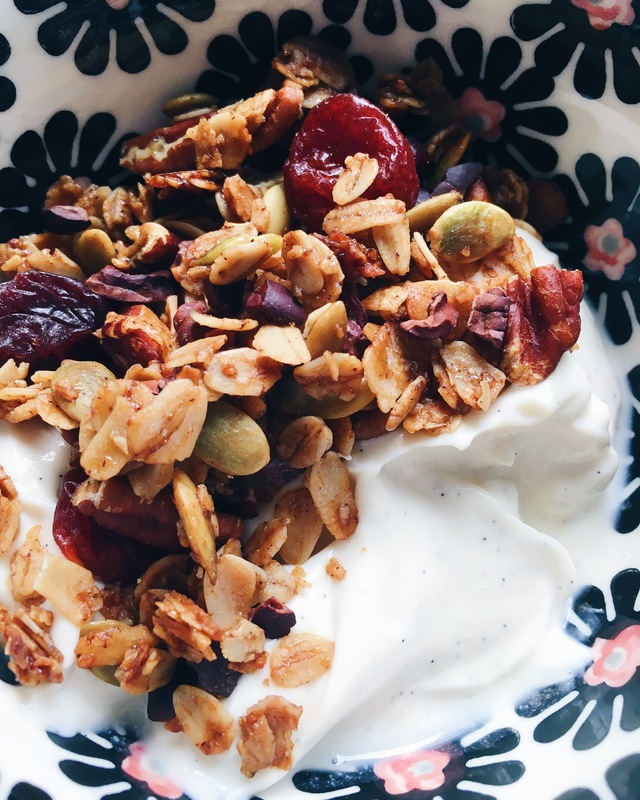 When it comes to breakfast, one of my favorites is a bowl of yogurt with some homemade granola on top. 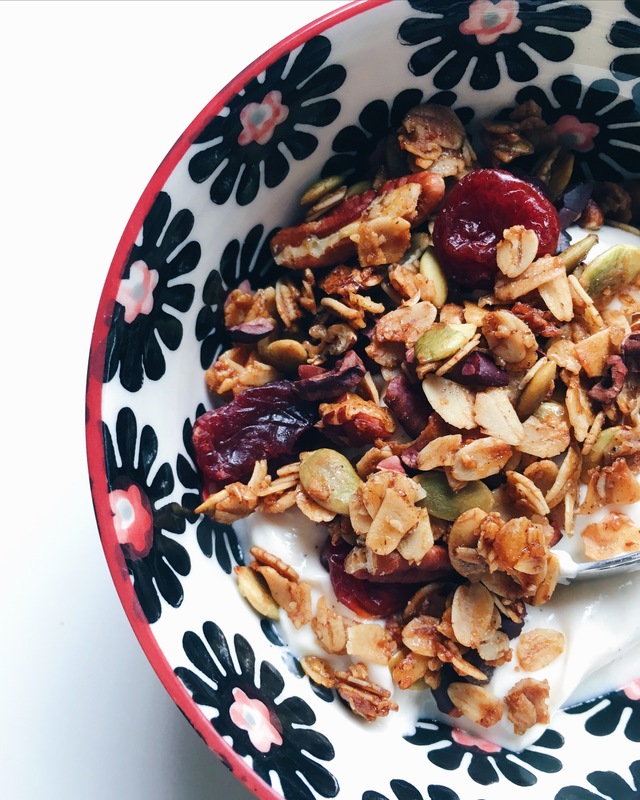 I love the contrast between the sweet and cold yogurt with crunchy-chewy granola. 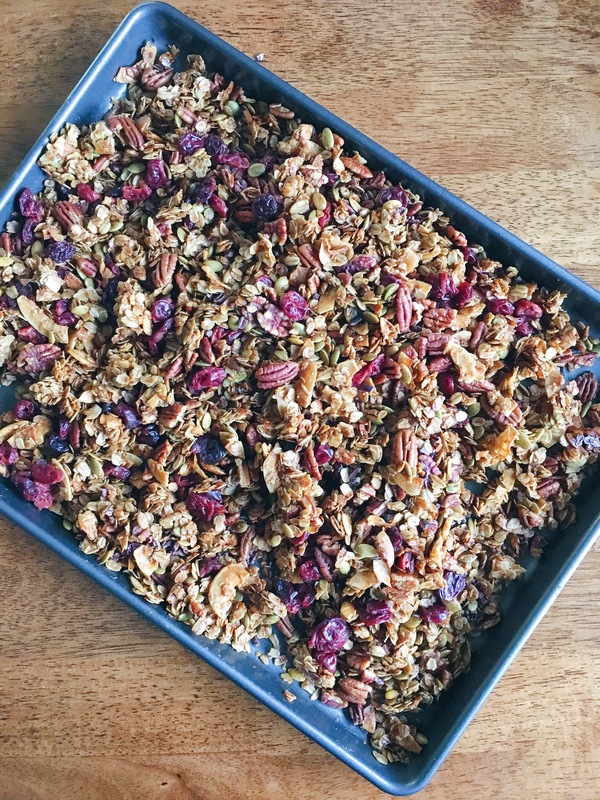 I wanted to revamp my Pumpkin Spice Olive Oil Granola recipe with some fresh and healthy ingredients. 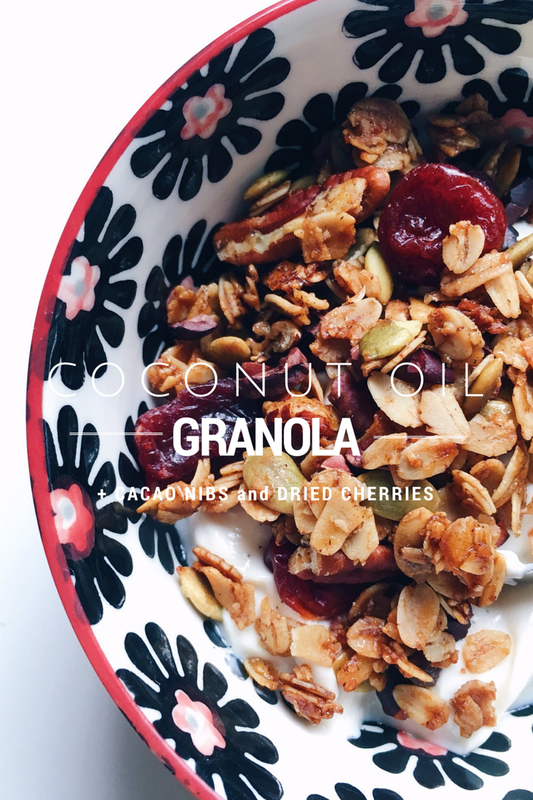 I swapped olive oil for coconut oil, maple syrup for coconut nectar, dried cranberries for cherries, and cardamom for pumpkin spice. For a little extra crunch I added in some cacao nibs to top it all off. 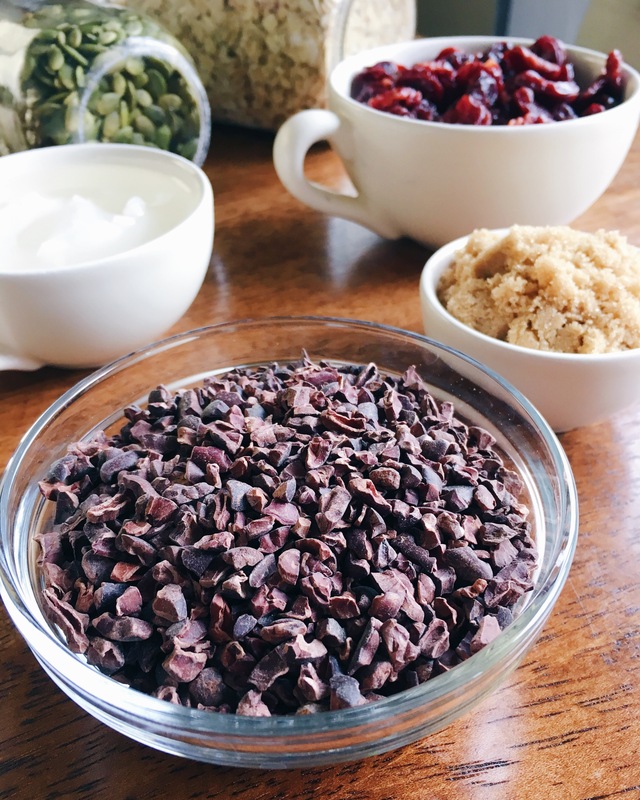 Here’s what you’ll need for the goodness that is Coconut Oil Granola with cacao nibs and dried cherries The cacao nibs are crunchy and have a slightly bitter chocolate flavor that add a great contrast to the sweet dried cherries. When the granola bakes up it will make your house smell so yummy like warm coconut and cinnamon. I love the smell of coconut oil and it really came through when baking. After the granola is baked and fully cooled the dried cherries and cacao nibs get added into the mix. My mom recently introduced me to Noosa yoghurt, it has a really thick and creamy texture and isn’t too sweet or overpowering to enjoy with the granola. 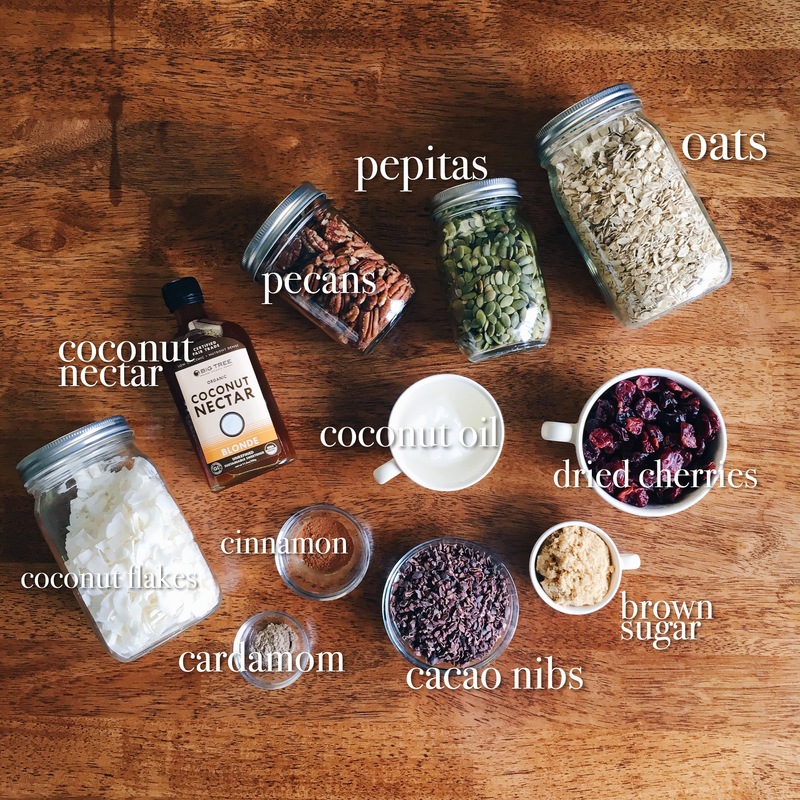 In a large mixing bowl combine the oats, nuts and coconut flakes. In a separate bowl combine the coconut nectar, coconut oil¹, brown sugar, salt and spices. Stir the wet mixture and pour over the dry ingredients. Toss the wet and dry ingredients until everything is evenly coated. 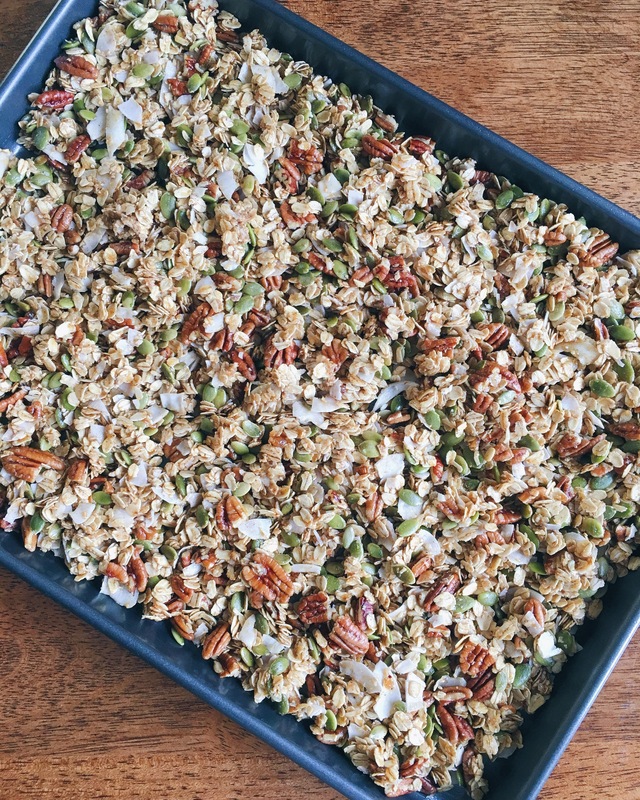 Grease a large baking sheet and spread the granola mixture out evenly across the entire pan. Bake at 300ºF for 40 minutes, stirring every 15 minutes. The granola will be golden brown when removed and will become crunchy as it cools. Once the granola is fully cooled add in the dried cherries and cacao nibs. ¹Microwave the coconut oil for about 15 seconds until it is liquid so it can be easily mixed with the other ingredients. 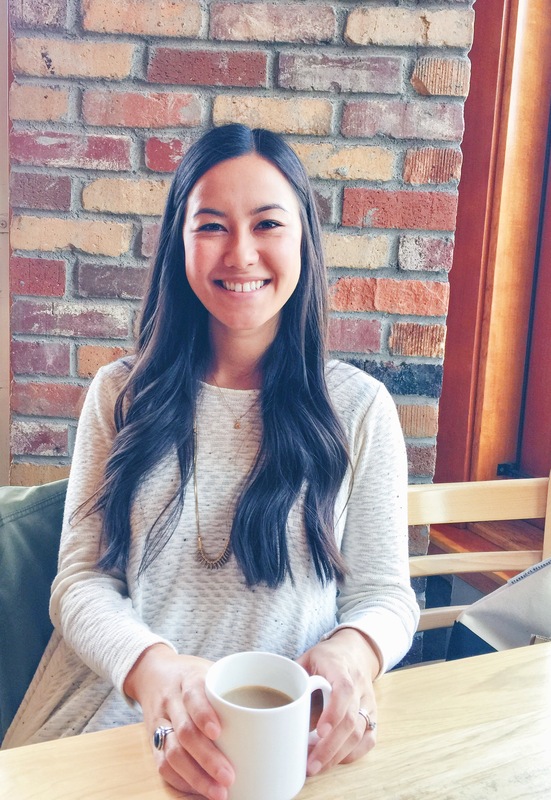 To store let the granola cool completely and put in an air tight container such as a mason jar. The granola should keep for a few months in a cool dry space.